Odling av andra växter än cannabis. Nu har jag bestämt Mig! Sitter och ser på ett program på SVT 1 "Örter – naturens eget apotek"
06:05 - 06:25 det är visst en Dansk faktaserie från 2006. Dagens avsnitt handlar om Aloe Vera. Fick lära mig massor med nytt, bl.a. att det finns över 400 st olika arter / variationer utav Aloe Vera...av dessa är det endast 5 st som används inom medicinen. Aloe Vera Barbadensis lär tydligen vara den vanligast förekommande aloe veran, om jag har förstått det rätt. Nåväl, nu är det dags att utöka mitt apotek här hemma! A very well-known herb that is found growing in Tenerife and the Canaries. In Spanish it is known as Linaloe, Acibar and Zabila, whilst other English names include Aloes, Barbados aloe, Cape aloe and Curacao aloe, but whatever it is called, Aloe vera is certainly one of the most useful medicinal herbs around. The mixture of constituents present in it give the herb exceptional healing properties. Aloe vera contains polysaccharides that help boost the immune system, anti-microbial and anti-inflammatory agents that help fight off disease, and antioxidant vitamins C, B12 and E, which are all vital to bodily health. It also contains amino acids and various minerals and trace elements. A gel made from Aloe vera leaves is used to treat burns, sunburn, eczema and skin conditions, and to help wounds to heal. This preparation is applied externally but in the form of tablets, capsules or as a juice the herb is also taken internally for ulcers and other digestive disorders, for an irritable colon, and as a general tonic as well. Aloe vera has recently been used in the treatment of cancer and AIDS. The herb has also been employed as a laxative and a strong purgative medicine known as “bitter aloes” is prepared from the sap of the leaves. In addition to all the health-products it is in, many cosmetics contain Aloe vera as well. It is often used as an ingredient of preparations for protecting against the UV rays of the sun, and so it is very apt that the plant grows in hot climates. Herbalists in the past knew the considerable value of the herb as well and it is said that Aristotle once attempted to persuade Alexander the Great to conquer the island of Socotra in the Indian Ocean, just because it was the only place known where Aloes were growing at the time. Besides being used for its healing properties the herb has also been used as a religious symbol, and Mrs M. Grieve, writing in A Modern Herbal, reports that Muslims who have made a pilgrimage to the shrine of the Prophet are entitled to hang the Aloe above their doorways. Apparently it is believed that this will protect the householder from any evil influences. In Cairo, the Jews have also adopted the practice of hanging up the herb over the door. 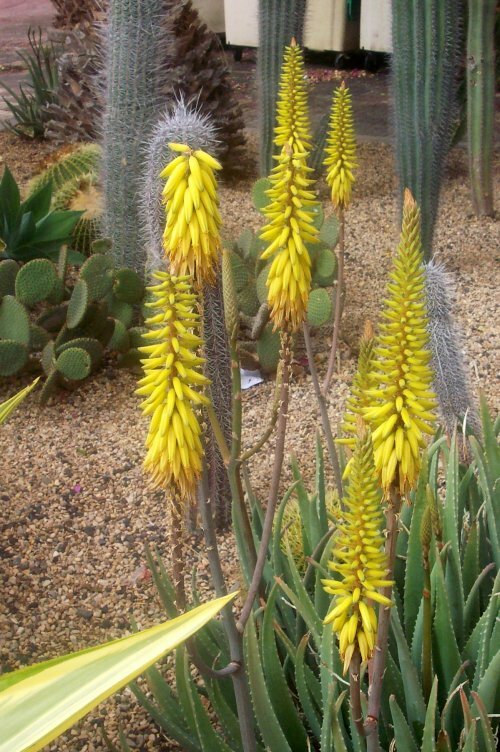 The ancient Egyptians prized Aloes too and used it as an embalming ingredient. Aloe vera’s place of origin is somewhat uncertain, although it is believed to have come from Africa or Southern Arabia. It is also found growing in many tropical and subtropical regions throughout the world. Aloe vera was introduced to Europe in the 10th century and became established over the years as an ingredient in many proprietary medicines. It is a succulent with clusters of greeny-grey leaves, which are spiked at the edges and it bears tubular yellow flowers on spikes carried above the rosette of leaves. Aloe vera can grow to 40-60cm (2-3ft) tall and favours dry, sunny locations. Although it is such a useful herb, a word of caution is still necessary because it should not be taken in large doses or be consumed by pregnant women. There are also legal restrictions on Aloe vera in some countries. Because Aloe vera and other species of Aloe are attractive and unusual in appearance they are often grown as houseplants. Jag odlade en ca 8 olika medicinalväxter förra sommaren. Skördade nu i höstas. Har ett stort föröd av sömngivande örter, smärtstillande samt uppiggade. Man kan också blanda olika örter. En favorit är Äkta Johannesört blandat med Kamomill. jag har aloe vera själv. otroligt tålig växt. har knappt sett solen på flera månader och mår som en prins. Återgå till "U| Övrigt odlande"